Canada's Prime Minister Justin Trudeau has put equality at the heart of his leadership, championing LGBT rights and feminism. He also recently announced a raft of new trans rights protections, that will bolster anti-discrimination protections on the grounds of gender identity, and will also protect trans people under hate speech laws. 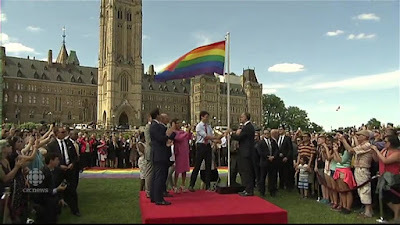 Yesterday, Trudeau joined with MPs from across the political spectrum to mark the start of Pride Month by raising the rainbow flag from the Ottawa’s historic Parliament Hill. It is the first time that the pride flag has been flown from the Hill. Prime Minister Trudeau told the crowd: “This is a great day for Canada and it is part of a long series of milestones this country has hit over the years". And he added: “It hasn’t been easy, it hasn’t been automatic. A lot of people fought for a long time for this day and for the many days that led up to this day to happen”. 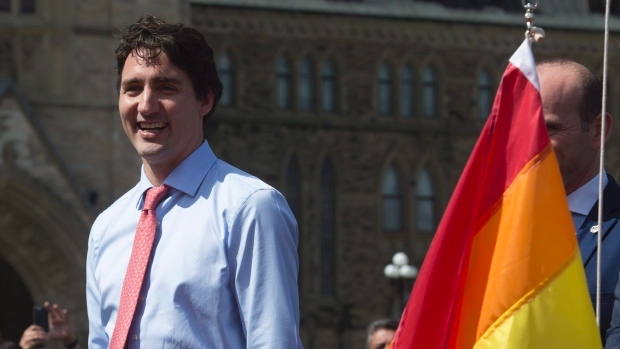 Trudeau plans to attend this year’s Pride parade in Toronto, making him the first Canadian PM to do so. 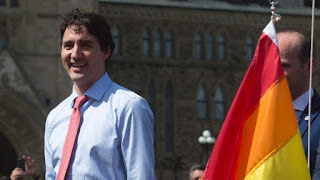 Though it will be his first time attending in his new capacity, Mr Trudeau has attended Pride in the past a number of times as an opposition MP.